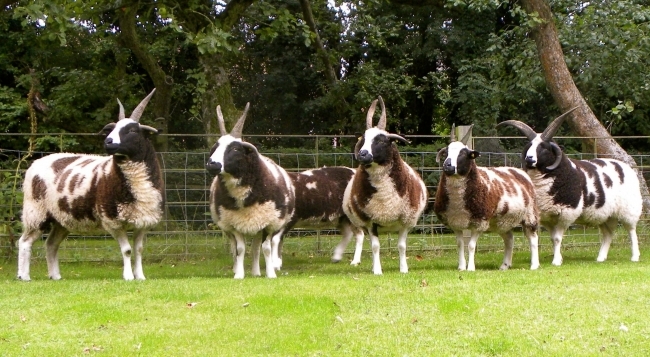 Jacob sheep are an ideal breed for both large and small flock masters and possess many features and benefits. 190% born alive is a realistic lambing percentage. High lambing percentages are to be expected, particularly to ewes lambing later in the season. The breed is noted for its easy lambing attributes, which is ideal for novice or first-time sheep keepers or for those whose time is limited. This is also a benefit where saving labour on the farm is desirable. Jacob ewes show consistently good mothering qualities and many will successfully produce sufficient milk to rear triplets without resorting to supplementary feeding. Easily over wintered outside and attracting few disease problems. Jacob sheep also attract less foot problems than many breeds. Having good feet and high health status allows Jacob sheep to keep breeding for many years. Ewes rearing lambs for 7 years or more are not uncommon. Ideally suited for deep freeze or farm-gate sales. The exceptionally full flavour and leanness is retained even in hogget carcasses. Customers supplied direct always come back for more, preferring Jacob lamb to product sourced from regular outlets, often being prepared to pay a premium price for this quality. When crossed with any of the popular terminal sire breeds, the Jacob ewe produces fast-growing lambs capable of meeting the exacting standards of today’s retail trade buyers. They also produce high quality wool which is excellent for spinning and weaving. The unique colour of the wool makes every garment or woven item individual. The tanned sheepskins make very desirable rugs and the skins can also be used to make a variety of other goods. The Jacob sheep also has many other attributes apart from its excellent mothering abilities, prolificness and carcass quality that make it the perfect choice of sheep breed for any smallholder. A flock of Jacob sheep can make an attractive sight and add considerably to the front paddock or orchard. The breed yields a fairly soft fleece of good quality demi-lustre wool often sought after by local spinning groups and craft makers. The attractive skins of the Jacob breed can be turned into rugs. Stick makers also seek out horns from mature rams to produce attractive coloured crooks. Wherever you are in the UK, you won’t be far from a Jacob Society member. Your Regional Council member will be happy to put you in touch with someone who can offer advice and practical help if needed. Regional open days give the opportunity to meet other society members, gain knowledge and acquire new skills.